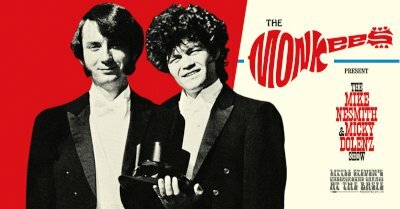 Mike Nesmith and Micky Dolenz began their tour on Friday (June 1) at the Chandler Center For the Arts in Chandler, AZ with a 33 song set list of Monkees and Nesmith classics. For those that saw the Monkees' last tour, almost half of the songs (16 of 33) are new to the show and three of the band's bigger hits, "A Little Bit You, A Little Bit Me", "(I'm Not Your) Steppin' Stone" and "D.W. Washburn" are gone with four from Nesmith's solo catalog added in. Nesmith and Dolenz brought along a nine-person backup band but the big draw is Nesmith's participation as he has rarely participated in any Monkees activities post-60's.